Come on, you men in red! Quite literally, that is. Come ON. You. Men In Red. I have not seen a distinct lack of effort so far in 2015. I have not seen a disinterested group. I have also not seen the same lineup. I saw a team overwhelmed in Los Angeles. I saw a team beaten by Vancouver on a goal which could have been prevented. I saw a team move a little bit closer to finding itself in San Jose. So now, I’m not sure what else to say, except COME ON. Come on Frank Yallop – get this squad YOU assembled threatening to score goals and defending with some attitude. Come on those of you who are not in your first year with the team – the expectation is you are not repeating your mistakes. Come on newcomers – if you see something you don’t like, go ahead and say it. Push the status quo out and a new era of player-led expectations in. Come on injured players – be less…injured! (I’m kidding.) I guess what I’m saying is when Mike and Patrick return to form, it would be nice to see you guys out there for a while. Consistency in the lineup is welcome! Come on Victor Perez – be really good in the midfield when the calendar turns to April. I’m not even going to try to pretend to know what Yallop is going to do here. David Accam and Shaun Maloney are unavailable (international duty) and Victor Perez won’t be lacing up his boots on Sunday either. Given what IS available here’s what I’d run out against an equally depleted Philadelphia side. Sticking with my COME ON! theme, let’s go ahead and send a 3-forward lineup out for the national anthem. Sean Johnson will likely see Lovel Palmer, Adailton, Jeff Larentowicz, and Eric Gehrig in front of him. Harry Shipp will headline the midfield, and I’d like to see Razvan Cocis and Joevin Jones as the base of a triangle behind Shipp (Polster has certainly provided a solid element, but I think Jones and Cocis could pair nicely). Wide attacking players include Alex on the left and Kennedy Igboananike on the right with Guly do Prado playing centrally in place of resident spark plug Quincy Amarikwa. Polster, Amarikwa, and Matt Watson offer versatility off the bench. I’m used to scratching my head when the fourth official raises the board for a Frank Yallop-born substitution. This trio at least offers potential to either score a goal if trailing or prevent a goal if leading when the time to change things up does arrive. I have no reason to believe the Fire will net two goals on Sunday, but I typed it anyway. Gehrig heads in a corner kick and Kennedy Ignoananike opens his Fire account. Union DP Fernando Aristeguieta continues his hot start with a goal to make things interesting after the hosts let their guard down. The Men In Red get their first points of the season. 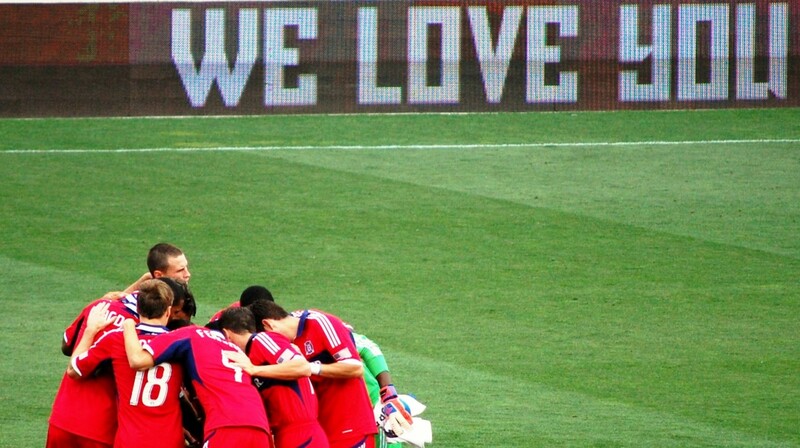 ← OTF Roundtable: Do the Chicago Fire Deserve Harry Shipp?